While 3-D pens and printers are enjoyed by students, artists and makers, innovative American companies are using similar equipment to manufacture aerospace, automotive and medical technologies. The number of technologies customized and created using additive manufacturing processes is growing each year. But understanding how the processes work takes more than prying open your 3-D pen. Many of the foundational techniques for additive manufacturing, briefly described below, were discovered and patented in the 1980s. The development of three of these methods—selective laser sintering, sheet lamination and 3-D printing—had critical support from the National Science Foundation (NSF). Additive manufacturing is a way of making 3-D objects by building up material, layer upon layer, with the guidance of a digital design. The processes are engineered to use material more efficiently, give designs more flexibility and produce objects more precisely. Above all, they make things quickly. "Early research led to making prototypes to determine the form and fit of the parts in an assembly, such as an engine," said Kesh Narayanan, deputy assistant director for NSF's Engineering Directorate. "Large-scale manufacturing of parts, especially critical components, at attractive cost is the ongoing challenge for broader use of additive manufacturing." More and more companies are taking on the challenge of commercializing these foundational technologies, including the very first one, stereolithography. Stereolithography was invented by Charles Hull, the founder of 3D Systems, Inc. (patent 4575330 filed in 1984, awarded in 1986). This process, sometimes called vat photopolymerization, begins with a vat filled with a special resin; resins are thick liquids that can permanently harden into solids. Some resins cure rapidly when exposed to a certain light spectrum. Dentists use similar light-activated materials as adhesives, because they can be set quickly with the help of a laser. Next, following a digital design, a laser targets an area just above a platform within the vat, causing the liquid resin there to selectively harden. Then, the platform moves down slightly, and the laser activates the next layer of liquid resin, linking the molecules together in a process called polymerization to form a solid object. Selective laser sintering was invented by a University of Texas at Austin graduate student, Carl Deckard, and his advisor, Joseph Beaman (patent 4863538 filed in 1986, awarded in 1989). Also known as powder bed fusion, the technique uses a computer-controlled laser to selectively "sinter," or fuse, cross-sections of powder into a solid. The powder can be ceramic, metal, plastic or polymer, depending on what properties the object must have. The energy from the laser heats the powder just enough to join the pieces together, similar to how the gentle warmth of hands can form powdery snow into a solid snowball. After one layer is sintered, the next layer of powder is applied and sintered according to the design. Sheet lamination, also known as laminated object manufacturing, was invented by Michael Feygin, the founder of Helisys, Inc., formerly Hydronetics, Inc. (patent 4752352 filed in 1987, awarded in 1988). In this process, a laser cuts a thin sheet of paper, plastic or metal into the desired shape, and then another layer is bonded on top and also cut. By repeating these steps, objects with intricate, complicated shapes can be quickly formed at low cost. Material extrusion was invented by S. Scott Crump, founder of Stratasys Ltd. (patent 5121329 filed in 1989, awarded in 1992). The process, sometimes called fused deposition modeling, pushes liquid plastic or metal out through a nozzle, right along the path on the digital map. A similar technique is used by a pastry chef while piping a layer of melted chocolate through the pointy tip of a pastry bag. The molten material quickly cools and hardens, and a new layer can then be added on top. Just as chefs may use different concoctions and piping tips to create unique shapes with exactly the flavor, stiffness or other properties needed, material extrusion allows engineers—and enthusiasts—to quickly make new designs into objects meeting their specifications. 3-D printing was developed by a Massachusetts Institute of Technology team led by Emanuel Sachs (patent 5204055 filed in 1989, awarded in 1993). Also known as binder jetting, the technique involves laying down a layer of a powder and then squirting a liquid binder on the areas to be solidified. While similar to conventional ink jet printers, 3-D printers are able to build additional layers on top of previous ones to construct 3-D objects, even sophisticated objects that could serve one day as medical implants. 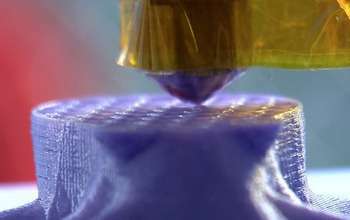 Other additive manufacturing techniques include various material jetting processes and directed energy deposition. The origins of additive manufacturing processes can be traced to the 1970s and 1980s, when researchers began exploring new ways to make things. Then, as now, common manufacturing processes included casting/molding, forming, joining and machining. At this same time, new techniques for solid modeling were coming to fruition. The modeling techniques enabled researchers to translate 3-D geometries into mathematical terms, which could then serve as instructions for equipment control systems. The new additive processes, combined with advances in solid modeling, today enable rapid fabrication from a digital model, in a range of geometries beyond the capabilities of other methods. "Additive manufacturing—with its versatility, efficiency and ability to quickly link geometric design to distributed production—can really accelerate product deployment," said Steve McKnight, director of the NSF Division of Civil, Mechanical, and Manufacturing Innovation. McKnight continued, "To realize the full promise of additive manufacturing, researchers will need to discover new ways to increase speed, lower costs, improve consistency and develop and qualify novel materials for all kinds of applications. It will take the ingenuity of engineers, students and makers."